Oh my goodness you guys. I have been gone for a minute and I've missed you. I've been Periscoping pretty randomly and with the lack of daylight due to daylight savings, it's killing me. I usually scope or film in natural light so since that's limited, I'm at a loss. I have been re-focusing everywhere but this blog. So, let's see. I've been painting and when I finished the 100 day challenge I updated my Etsy shop with new watercolor prints from that challenge as well as adding new photos to show the prints themselves too. I hope that helps with envisioning how they look in real life and they are super cute. Could be a little biased though. 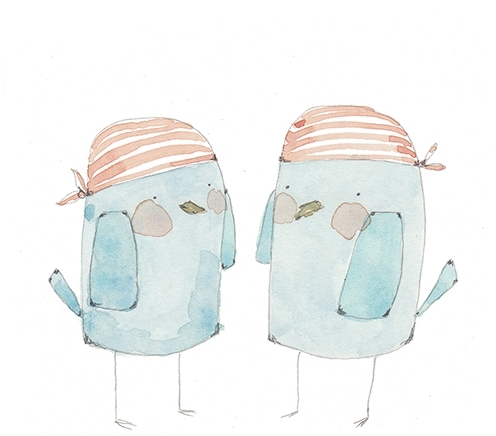 I joined Society 6 forever ago as well but I updated that too so now there are more cute characters on phone cases, totes, mugs, pillows and more. I don't know when they made changes but it is so much easier to add products now. Check them out and follow me there! I've been painting two side projects, The Reindeer Squad and Christmas Sweater Birds (birds in Christmas sweaters that say Joy, Peace, Noel, etc, eep!). I've only shared little sneak peeks on my Instagram (@fluximagery) so far but I will be launching those designs very soon. Join my newsletter so you don't miss a single update. The prints and products available make great gifts! After all, Christmas is right around the corner. I have been messing with my process too. Order of operations is big for me so first I would just dive into the watercolor paper with my sloppy paints. I didn't get anywhere because I didn't know where I was going. 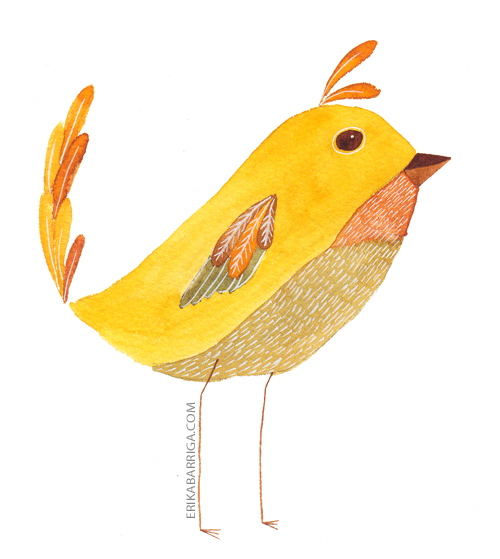 I am extremely methodical with my digital art but watercolor is a completely different beast to me. So, I would read and watch other painters I admired and try what they did. Some sketch, then bring the sketch into photoshop and compose the image, then print out the image, then use a light-box to trace it onto the watercolor paper and then go for it with the paint. When I follow those steps, by the time I get to the painting phase, I'm paralyzed. Watercolor paint is so expensive, watercolor paper is not cheap either, then you add in the brushes.....everything I paint better be a masterpiece at this point. That is what I hear in my brain, that very loud annoying voice. What I am finding that works for me (knock on wood that doesn't jinx it) is that I sketch out elements I might want to paint on computer paper. Just scribble and freely draw. Then when I think I have my elements, I will sketch out a composition. Then I come to my paper and freely draw my composition but not too much. Everything doesn't have to be planned in advance, a nice mix is nice. Lastly, it's time to paint. Parts can be wet into wet, other parts wet onto dry, etc. But I eat that elephant one bite at a time. Oh and chanting that no one is going to see this helps too. I tell myself I'm painting for me (which I am, it brings me joy) and if it doesn't turn into anything it isn't a big deal. I think this mind play is working for me. I am taking in all of these opinions and methods of how other painters work and finding what works for me so I can just paint. That is by far my favorite part. The painting above is called My Home and 6x8 prints are available in my shop! I used to get a little lonely when I rode the light rail, so I figured this little guy would get lonely at the bus stop. Hope it doesn't take too long to arrive. This is my attempt for the theme of Lonely for Illustration Friday and it is also an entry for 52 Designs. Now available in my shop. Summertime has me thinking about refreshing fruit like raspberries and tangerines. 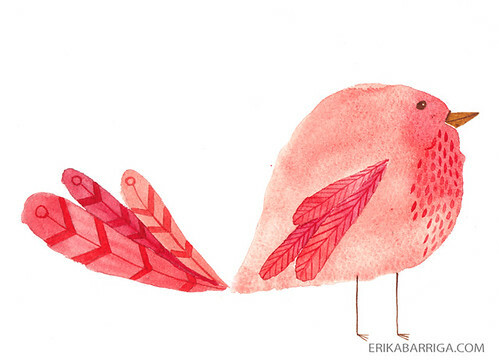 These are two new bird prints now available in my shop. Hope you having fun in the sun!! Had a friend over today so that gave me even more of a reason to straighten up and get my shop updated with new prints. Friends always tend to give you just the right push at just the right time. 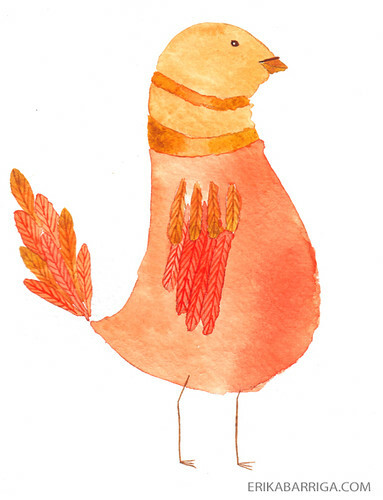 So, the shop is back open and there are three new pieces: Russian Owl, Chevron and Punk Rock. Baby girl is calling me, have to go for now. Hope you have a fantastic weekend! It's Leap Year with An Owl and Ducks. I have been silent but painting. Both prints have been added to my shop. So yay for that. I think I love Fabriano paper much more than Arches. Of course I would choose that one because it s harder to find around these parts. That's how I roll. How are you doing on this lovely leap year day? This is item number 18 in my shop! 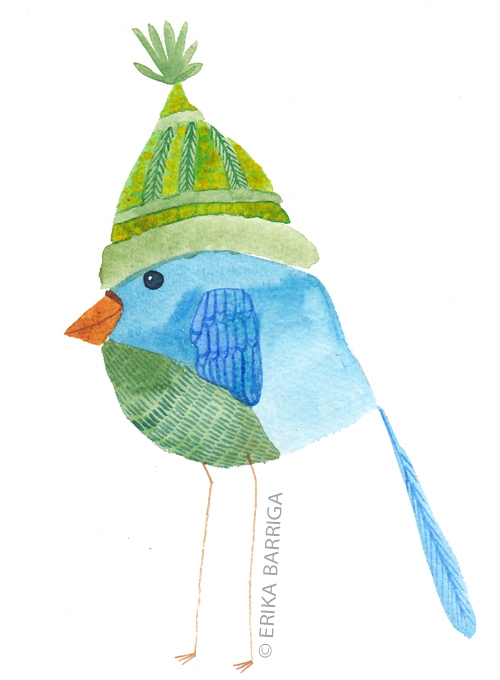 A sophisticated but warm little birdie. 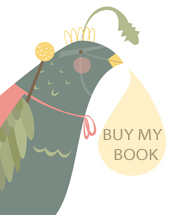 All print purchases made by February 9 will include a greeting card with my Love Bandits birds on the front. One week left! Officially pooped, as always. Time for bed. Goodnight and sleep tight! 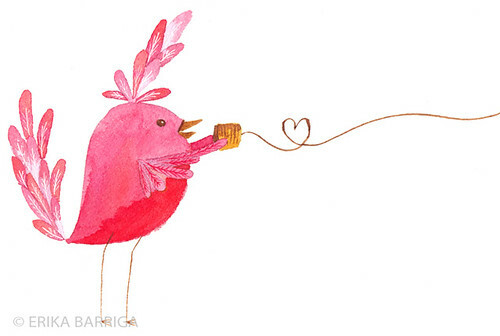 This bird has so much to love to share, the coil twirled into a heart. This is my attempt for the theme of Twirl for Illustration Friday and it is also an entry for 52 Designs. Oh, and as a sidenote, if you follow me on Twitter I mentioned I would share some products I am loving for my dry hands and lips. So here goes my items, all from Bath and Body Works. C.O. Bigelow Chapped Hands Remedy is amazing and the only thing that has worked so far. My hands were decrepit, trust me. C.O. Bigelow Lemon Lip Balm is so nice on my lips, feels good and tastes delish! C.O. Bigelow SPF 15 Mentha Lip Balm Stick (No Shine Formula) is really good too BUT wear something on top. It makes my lips very whiteish, like I have a cold or something. Not a good look. So I either put it on super thin or put some lip gloss on top. The peppermint flavor is nice, tastes like Christmas all year. If you have a beauty secret for dry skin or just a beauty secret period, share! Purty please. 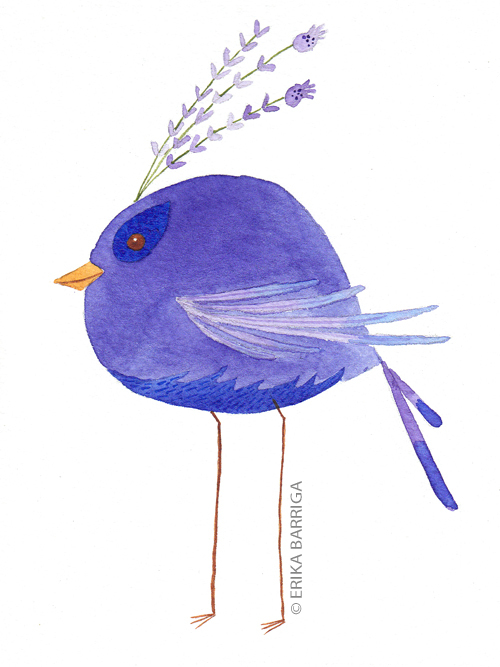 This lavender bird reminds me of Black Swan, something mysterious about him. 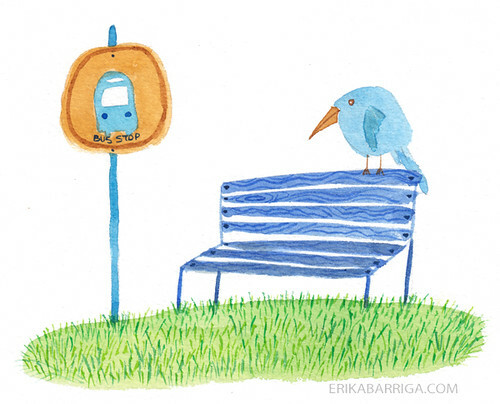 I've added this print, the Red Bearded Blue Birds (Vanity) and the Grounded Bird to my shop! I hope you have a fun and long weekend. Now available in my etsy shop! I had a scare today, thought I lost my sketchbook at the gym. Thank God my friend saw it and has it, can pick it up tomorrow. That was a close one!! 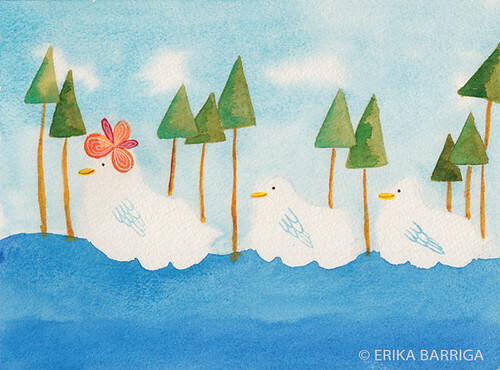 I am working on watercolors lately, nice break from the alphabet project. Trying to decide which technique I like more, for now I am getting a handle more on wet paint on dry paper instead of wet into wet. Baby steps. Charles Reid but his work/style seems so unobtainable for now. Tiffanny Varga - beautiful work and she is so nice to share her tutorials/painting online. Anna Emilia - she is so delicate and unsaturated. love. Gennine - she also shows video of her painting as going over her tools and such. 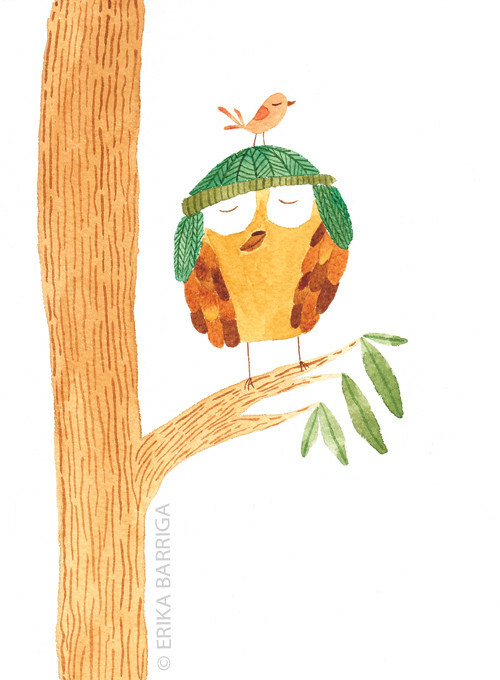 Golly Bard - love her birds and the way she sees nature. I have lots to learn. Thanks for your comments though, I love them!